Mary Elizabeth Williams has a really good piece about how not reading comments on her Salon articles has made her happier and saner. If you do any writing on the Internet - either in the form of blog posts, articles, or comments - you should read the whole piece. But I was struck by the comment above. 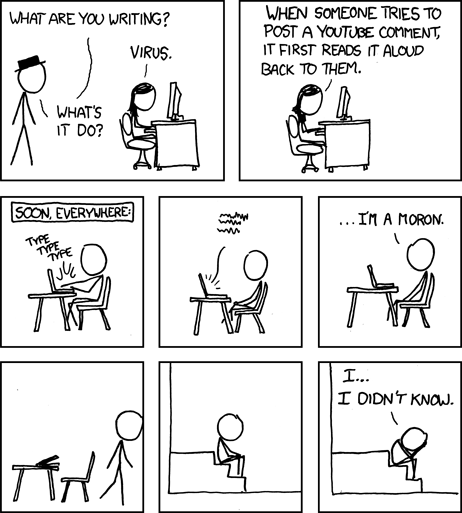 It does often feel like it's our responsibility to read and interact with every comment. We are trying to build a community, after all. But where do we draw the line. Whom do we engage? While not a hard and fast rule, I typically engage every comment on this site. I really am trying to build a community and by far the majority of commenters honestly want to engage in dialogue, and some of these dialogues have been fantastic and challenging. But I also write for the ABPnews blog, and have decided that while I will read those comments, I will not respond. To my commenters on this site, I am a real person that many of my commenters actually know personally. That is not the case for most of my readers over at the ABPnews blog. I'm not saying that they're horrible people, far from it. Nor are they the type of trolls that led Williams to give up comment reading altogether, but at least for now, this seems like the best practice. But more than that, I've thought about it in a different sense. My goal on the ABPnews blog is different than it is here. It is not so much academic, but it is much less personal. So, for instance, if I publish an academic article, I do not feel a responsibility to read every response to that article to feel like I am a good scholar and have appropriately vetted my ideas and facts. This is a loose analogy, to be sure, but this is how I've been thinking about my comment policy. Another option, of course, is to lose the comment section altogether, because we all know that trolls are nothing if not lazy. If a nasty or completely ignorant response is not a click away, most will give up and move on. So, anyway, just a few thoughts on this whole online community thing and the state of (un)civil discourse in commenting. And a thanks for those of you here that engage respectfully and with a desire to entertain, inform, or challenge. It makes even the sporadic writing I do here more enjoyable and meaningful.